Acyclovir, USP, is a synthetic nucleoside analogue active against herpes viruses. 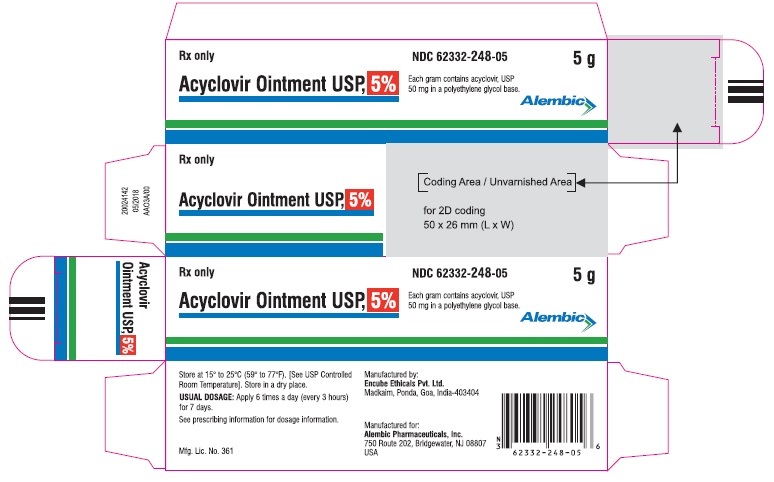 Acyclovir ointment USP, 5% is a formulation for topical administration. Each gram acyclovir ointment USP, 5% contains 50 mg of acyclovir in a polyethylene glycol (PEG) base. Drug Resistance: Resistance of HSV and VZV to acyclovir can result from qualitative or quantitative changes in the viral TK and/or DNA polymerase. Clinical isolates of HSV and VZV with reduced susceptibility to acyclovir have been recovered from immunocompromised patients, especially with advanced HIV infection. While most of the acyclovir-resistant mutants isolated thus far from immunocompromised patients have been found to be TK-deficient mutants, other mutants involving the viral TK gene (TK partial and TK altered) and DNA polymerase have been isolated. TK-negative mutants may cause severe disease in infants and immunocompromised adults. The possibility of viral resistance to acyclovir should be considered in patients who show poor clinical response during therapy. Two clinical pharmacology studies were performed with acylovir ointment 5% in immunocompromised adults at risk of developing mucocutaneous Herpes simplex virus infections or with localized varicella-zoster infections. These studies were designed to evaluate the dermal tolerance, systemic toxicity, and percutaneous absorption of acyclovir. In clinical trials of initial genital herpes infections, acyclovir ointment 5% has shown a decrease in healing time and, in some cases, a decrease in duration of viral shedding and duration of pain. In studies in immunocompromised patients mainly with herpes labialis, there was a decrease in duration of viral shedding and a slight decrease in duration of pain. 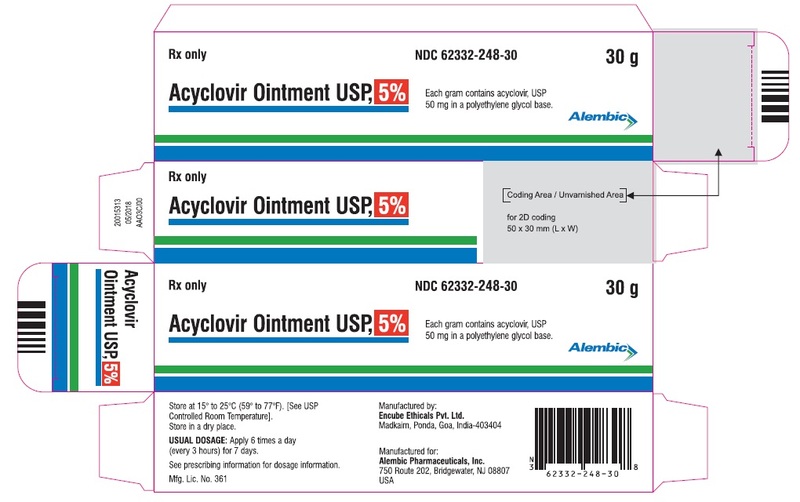 Acyclovir ointment USP, 5% is indicated in the management of initial genital herpes and in limited non-life-threatening mucocutaneous Herpes simplex virus infections in immunocompromised patients. Acyclovir ointment 5% is contraindicated in patients who develop hypersensitivity to the components of the formulation. The recommended dosage, frequency of applications, and length of treatment should not be exceeded (see DOSAGE AND ADMINISTRATION). There are no data to support the use of acyclovir ointment 5% to prevent transmission of infection to other persons or prevent recurrent infections when applied in the absence of signs and symptoms. 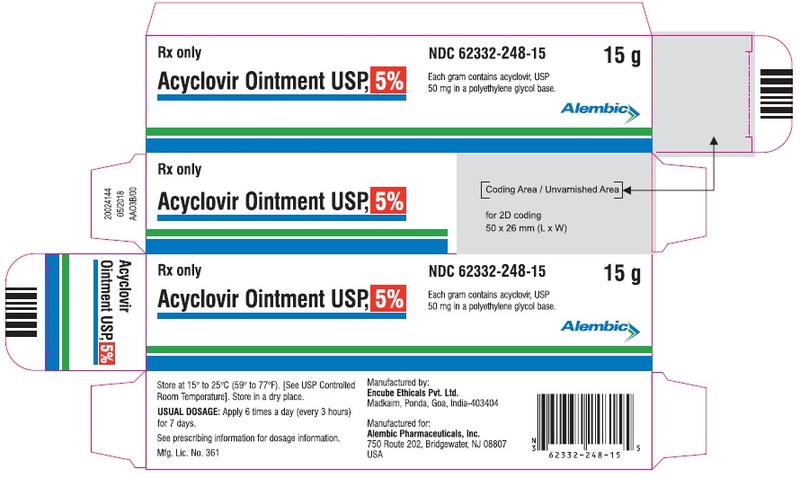 Acyclovir ointment 5% should not be used for the prevention of recurrent HSV infections. Although clinically significant viral resistance associated with the use of acyclovir ointment 5% has not been observed, this possibility exists. Clinical experience has identified no interactions resulting from topical or systemic administration of other drugs concomitantly with acyclovir ointment 5%. Systemic exposure following topical administration of acyclovir is minimal. Dermal carcinogenicity studies were not conducted. Results from the studies of carcinogenesis, mutagenesis, and fertility are not included in the full prescribing information for acyclovir ointment 5% due to the minimal exposures of acyclovir that result from dermal application. Information on these studies is available in the full prescribing information for acyclovir capsules, tablets, and suspension and acyclovir for injection. Pregnancy Category B. Acyclovir was not teratogenic in the mouse, rabbit, or rat at exposures greatly in excess of human exposure. There are no adequate and well-controlled studies of systemic acyclovir in pregnant women. A prospective epidemiologic registry of acyclovir use during pregnancy was established in 1984 and completed in April 1999. There were 749 pregnancies followed in women exposed to systemic acyclovir during the first trimester of pregnancy resulting in 756 outcomes. The occurrence rate of birth defects approximates that found in the general population. However, the small size of the registry is insufficient to evaluate the risk for less common defects or to permit reliable or definitive conclusions regarding the safety of acyclovir in pregnant women and their developing fetuses. Systemic acyclovir should be used during pregnancy only if the potential benefit justifies the potential risk to the fetus. Clinical studies of acyclovir ointment 5% did not include sufficient numbers of subjects aged 65 and over to determine whether they respond differently from younger subjects. Other reported clinical experience has not identified differences in responses between the elderly and younger patients. Systemic absorption of acyclovir after topical administration is minimal (see CLINICAL PHARMACOLOGY). Overdosage by topical application of acyclovir ointment 5% is unlikely because of limited transcutaneous absorption (see CLINICAL PHARMACOLOGY). Apply sufficient quantity to adequately cover all lesions every 3 hours, 6 times per day for 7 days. The dose size per application will vary depending upon the total lesion area but should approximate a one-half inch ribbon of ointment per 4 square inches of surface area. A finger cot or rubber glove should be used when applying acyclovir ointment 5% to prevent autoinoculation of other body sites and transmission of infection to other persons. Therapy should be initiated as early as possible following onset of signs and symptoms. Acyclovir Ointment USP, 5% is supplied as a white to off-white color ointment. Each gram of acyclovir ointment USP, 5% contains 50 mg acyclovir, USP in a polyethylene glycol base. Store at 15° to 25°C (59° to 77°F). [See USP Controlled Room Temperature]. Store in a dry place. Each gram contains acyclovir, USP 50 mg in a polyethylene glycol base.